Backups! 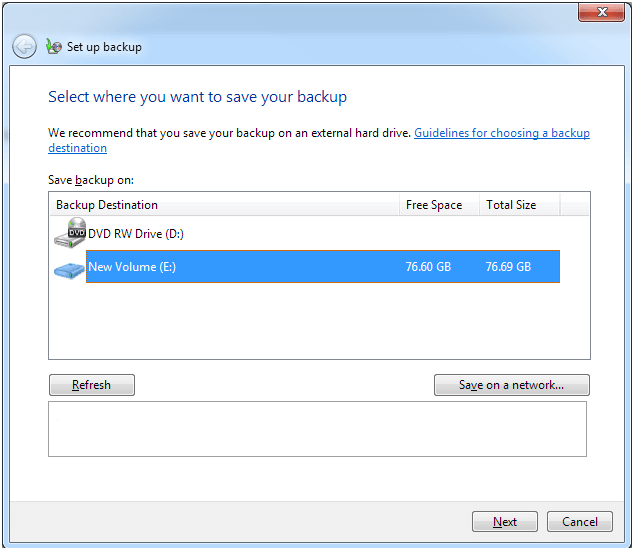 Backups are one of those things that everyone knows they should do, but many people don't. If your hard drive goes bad, though, you'll want that backup. 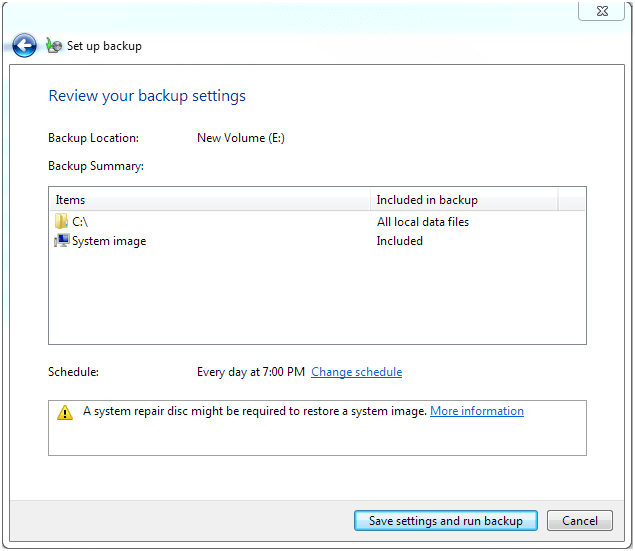 These instructions will help you to create a backup of your Windows 7 machine, and schedule it to run regularly. Remember that to back up your hard drive, you need a second hard drive as large as or larger than the one you are using. This can be an internal or external hard drive, we recommend external so that you can take the drive offsite so that you have a backup for disaster recovery. Before you start these instructions, you'll need to have connected your second hard drive. 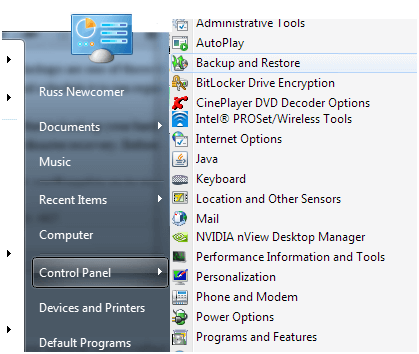 First, go to Start – Control Panel – Backup and Restore. 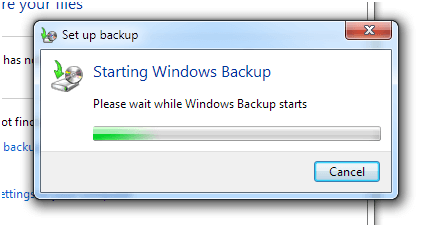 Next, click on Set up backup. You'll have to wait for the Backup service to start. You could backup to a DVD, but we are going to back up to an external hard drive located on E: Make sure your drive has enough space to hold your backup! Select it, and then click Next. 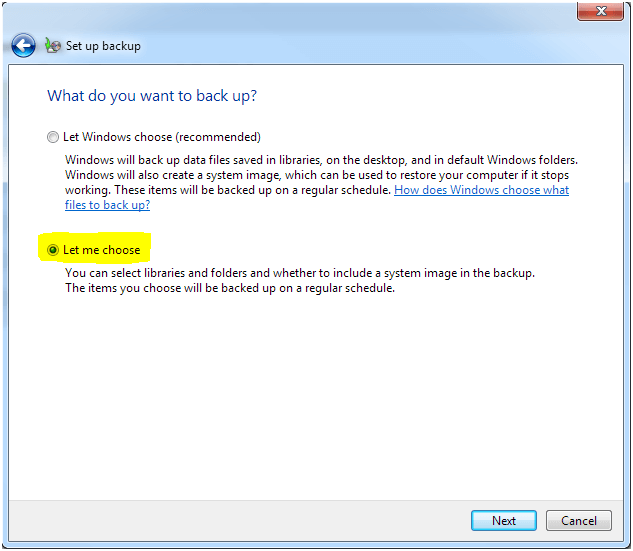 We're going to pick what we want to have backed up, so select Let me choose, then click Next. We're going to uncheck the Library folders and instead check the box to back up all of the C: drive. Your options may include a D: or E: drive as well. Then click Next. We want to change the schedule so that the backup happens more often, so click on Change Schedule. 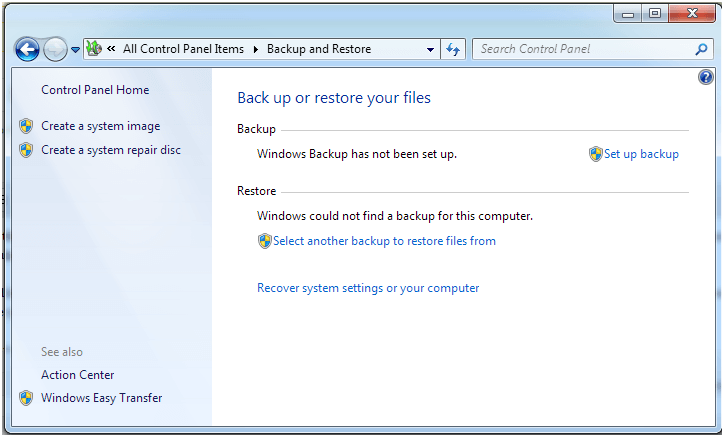 You'll want your computer to backup at a time when it will be on but you won't be using it. 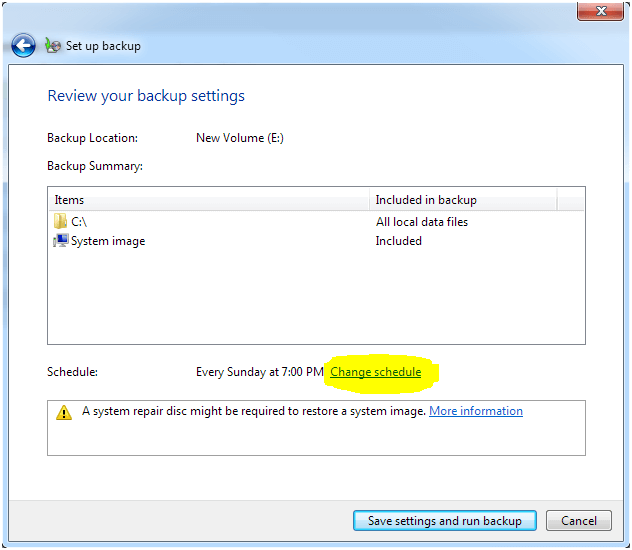 For this example, we want to back up every day at 7:00 PM, so we'll change How often: to Daily, and change the time to 7:00 PM, then click OK. Finally, we're ready to run it! 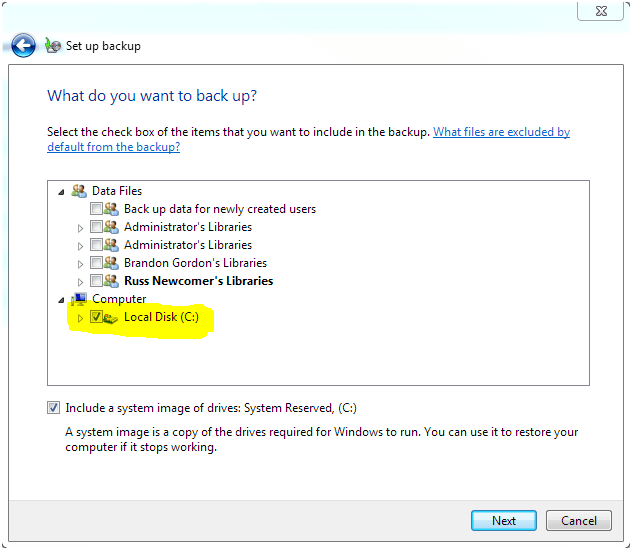 Click Save settings and run backup. 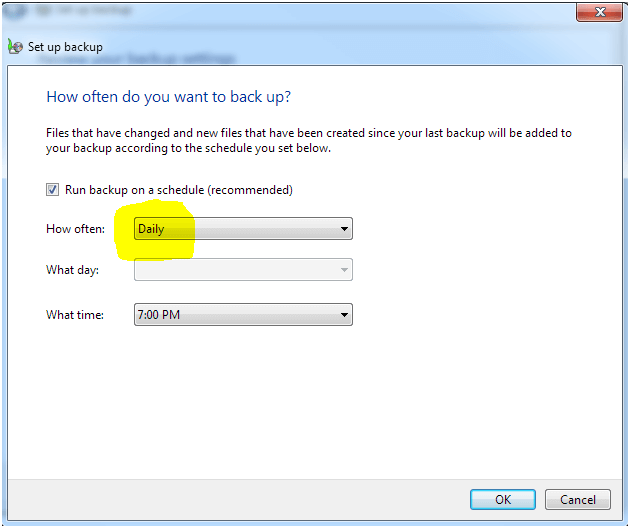 Your backup will now run daily at 7:00 PM, and you'll have a good backup of your data! At RUN Networks, we also offer a managed backup solution that we will monitor to ensure that your data is being backed up. Using our services, if your hard drive goes down, we can get you back up and running with a new hard drive in a few hours. Call or email us today if you would like to know more.